The Ministry of Defence (MoD) says it has charged nine people with aggravated trespass after a hole was cut in the perimeter fence of RAF Fairford. Nineteen anti-war protesters from all over the UK were arrested at the Gloucestershire base on Sunday. It follows a week of demonstrations against the arrival of US B-52 bombers. The MoD says they will now appear in the civil courts. Defence Secretary Geoff Hoon gave permission for the bombers, which are expected to be at the forefront of any initial attack against Iraq, to be sited at Fairford. Gloucestershire Police said the nine women and 10 men arrested were aged between 19 and 37 and came from all over the UK - including Oxfordshire, Cardiff, London, Tyne and Wear, Manchester and Surrey. One of those charged with aggravated trespass will appear before Cirencester magistrate's court on Tuesday, and eight are due before Cheltenham magistrate's court on 26 March. Police have stepped up patrols at the base and invoked special stop and search powers to detain anyone regarded as suspicious within a mile of the perimeter fence. A spokesperson confirmed the fence had been cut but added: "At no stage was the security of the base compromised." Two people arrested on Sunday for breach of the peace were not charged, and three were released without charge. Three others were bailed to report back to Stroud police station on 21 March and two were given official police cautions. Earlier in the week police and the US Air Force issued a warning to members of the public about the dangers of trespassing on the grounds. They said: "RAF Fairford is an active military base where aircraft manoeuvres are now taking place. "We would like to highlight the inherent dangers which any trespass presents. "Anyone who unlawfully gets into the base property could place their own lives and those of others in danger whilst aircraft movements and other associated activity is taking place." 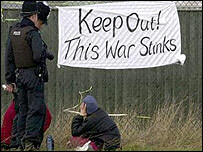 The base has been the focus of many anti-war protests, and a peace camp has been set up in the grounds of a nearby pub. Last week two women were arrested on suspicion of aggravated trespass after breaking through the security fence. Lindis Percy, 61, from Hull, was charged and is due to appear before Cheltenham Magistrates on March 19. The other woman was released without charge.